There’s just something about the character of Thomas Arashikage that appeals to almost everyone. 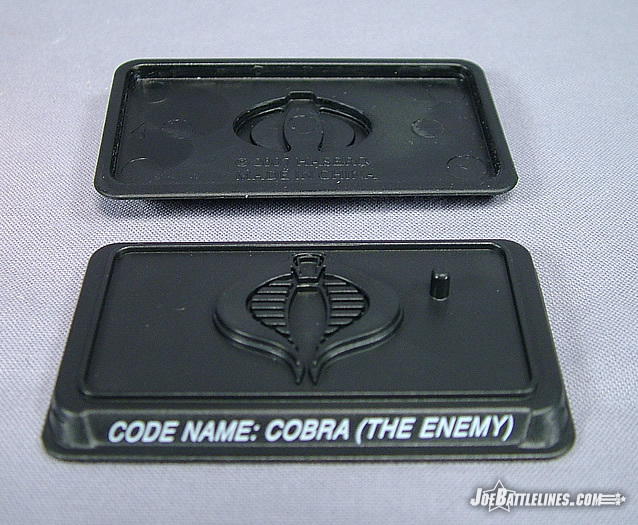 He’s been a Cobra, then a Joe, then a Cobra, and then a Joe again. His history has more twists and turns that the synopsis of an 80’s soap opera and yet, for the most part, fans have never abandoned his character. Even now, with his own monthly title, Storm Shadow is once again searching for a meaning to his complicated existence and, even now, fans are staying with the character. 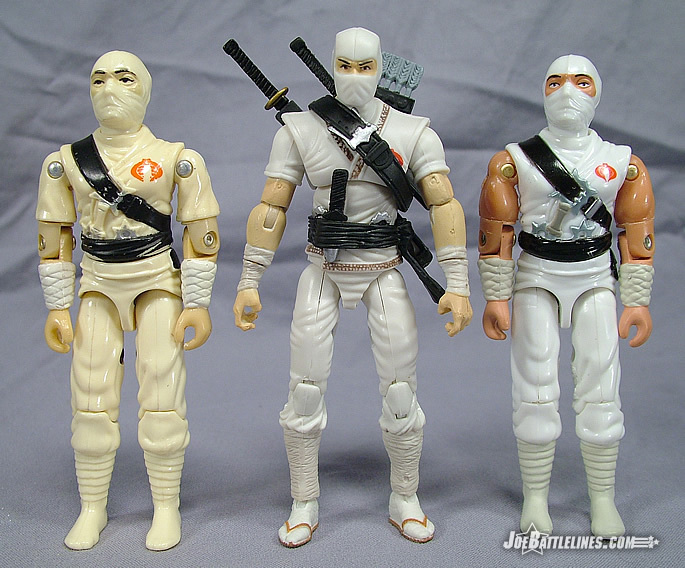 For the 25 th Anniversary Hasbro debuts Storm Shadow as the character we all knew and loved—the dreaded Cobra ninja! Body guard to Cobra Commander and hunter of his uncle’s killer, Storm Shadow had never been better. 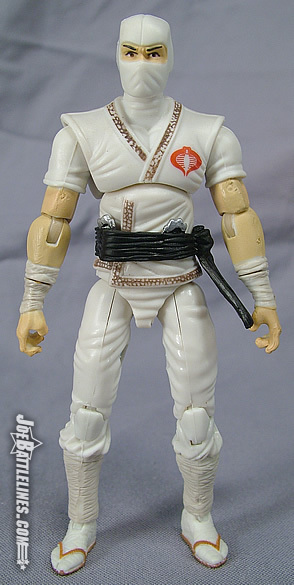 Yet, in a line so fraught with design flaws and missteps, does this figure live up to the legacy of Storm Shadow? Read on and discover one Joe fan’s opinion. I’ve always been partial to the original character design of Storm Shadow. Most likely this is due to the phenomenal use of the character in the first third of the Marvel Comic’s series, written by Larry Hama. Those early issues premiered the character as a mysterious warrior whose ties to Snake Eyes eventually helped to shape the course of the entire series. Here we have a figure of Tommy that almost seems lifted from the pages of those fantastic issues, right down to the strong jaw line and almost “Spock-like” eyebrows. 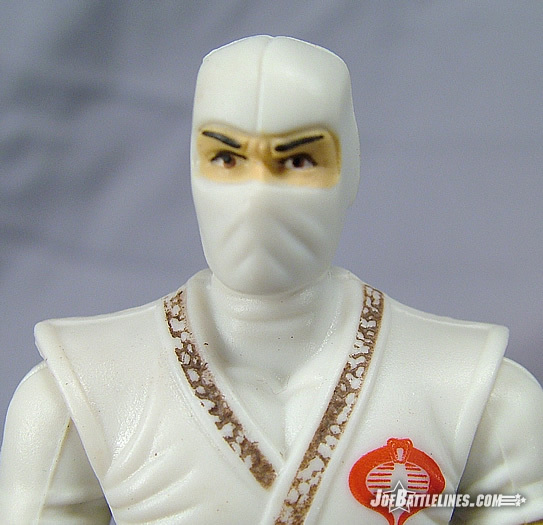 Storm Shadow is depicted in his original white ninja uniform with one a few small design changes made to add detail. The seams on the original figure were plain and unadorned while the new figure has a painted edge to his “pajama shirt”. 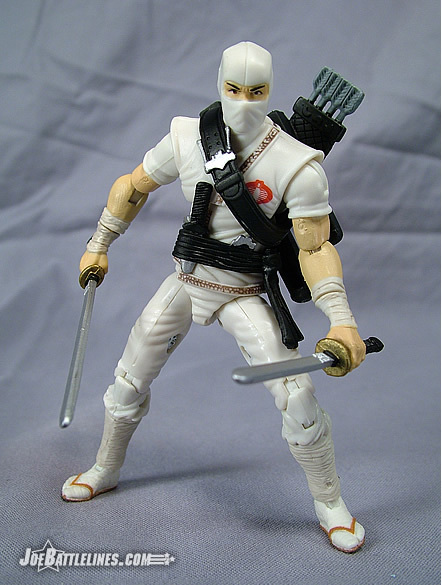 This figure maintains the short-sleeved look of Storm Shadow found on the original card art and not the sleeveless look of both the comic and the Sunbow animated series. I’m surprised at just how well this look comes together in the newly sculpted form; the figure still managed to convey the impression of a sharp-edged warrior, in spite of his “wee short sleeves”. Every element of the original design has been preserved, right down to the sculpted dagger and shuriken found on his sash belt. 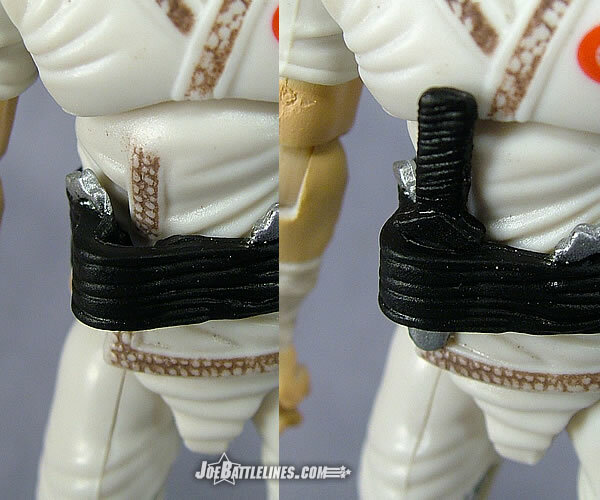 The belt itself has been attached to the plastic torso and actually features a small notch where Storm Shadow’s throwing dagger can be placed. The two shuriken are still part of the sculpt but the removable throwing blade is a fantastic addition to the design and one that opens up even more exciting options for displaying this figure. 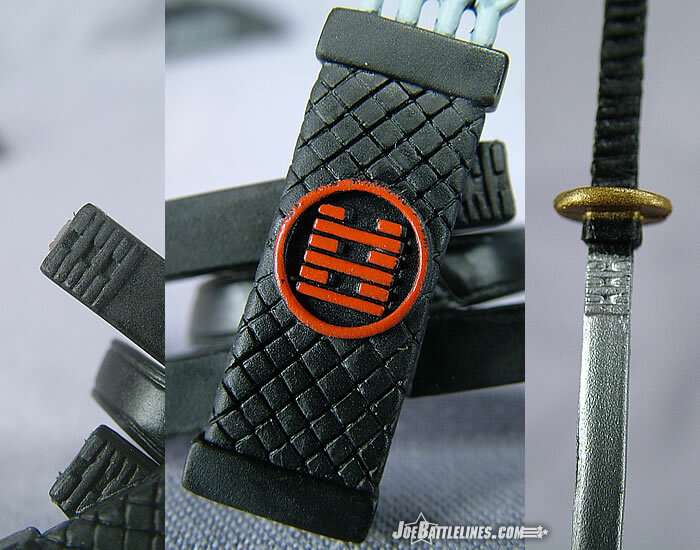 The black strap that crossed the chest of the original figure is also present but is no longer part of the body design; instead this strap is now part of the dual scabbard/quarrel backpack which allows Tommy to carry his arsenal with him. The only other change to the character is the inclusion of sandals into his design. These work well to add just a slight touch of realism to an already fantastic design. If there is a downside to this figure’s composition, it is found in Tommy’s exposed arms which are painted flesh tone rather than being molded in that hue. I’m not certain if it’s the paint used on my figure or if this is an “across the board” issue but the flesh tone just doesn’t look quite natural. It’s also spread inconsistently across the plastic and tends to flake some in the elbow joints. It’s a distraction from what is otherwise a very solid design. There’s not much to say about Storm Shadow’s head sculpt other than the fact that it is a fantastic improvement over the original 1984 figure. I’ll be honest—the head was the one aspect of the original that never quite worked in my eyes. It always seemed a bit wide and a bit too round and just didn’t convey the strong sharp lines found in both the comic and the cartoon series. This figure gives the fans a head sculpt that is as close to the definitive Storm Shadow v1 as is humanly possible. I can find no fault whatsoever with the design. Much like the head sculpt, Storm Shadow’s equipment kit is as near to perfection as possible. 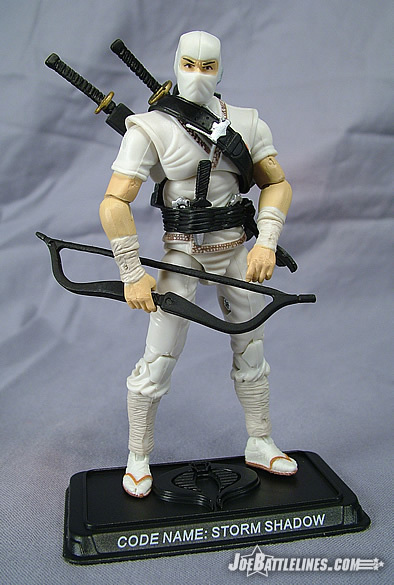 In addition to the standard replica file card and display base, Storm Shadow is packaged with his daisho (paired long and short swords), dagger, backpack, and his signature bow. 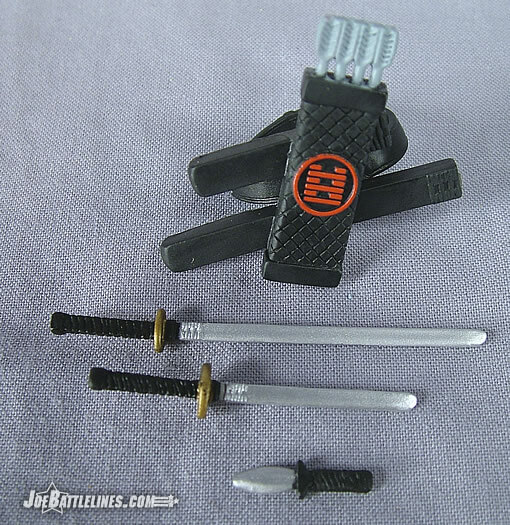 The weapons package is almost exactly the same as what was included with the original figure with one small exception: tonight the part of the nunchuck is played by the throwing dagger. Honestly, I don’t mind the substitution as the plastic nunchucks were never all that interesting to me as a child. The biggest change to Storm Shadow’s gear from the original is the prominent inclusion of the Arashikage hexagram on most of the component pieces. It is featured on the mouth of each scabbard on his backpack, on the center of the quarrel, and even just below the pommel of each sword on the blade. Had this been part of the original design, Snake Eyes would have had a much easier time identifying his former sword brother rather than waiting for an infirm Gung-Ho to spill the beans. Once again, this is an update to the original that I don’t mind at all—especially as this gear is recycled 100% for the single-carded Storm Shadow v2. 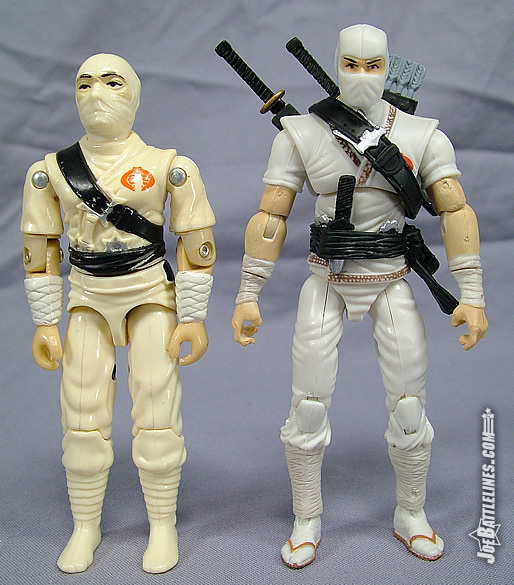 If I have one complaint about Storm Shadow, it is found in the soft plastic used in the molding of both of his hands. The material is soft—almost rubbery and extremely flexible. As such it has an amazing capacity to flex which is fine if you’re worried about breaking off his thumbs. 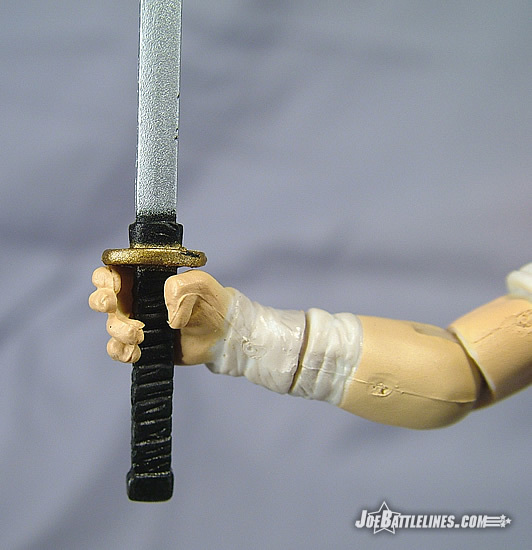 Where the softer plastic fails is found when the swords are placed in Tommy’s hands. Plainly put—the plastic is too soft to maintain a solid grip and, more often than not, the swords will either rotate in the figure’s grasp or fall out entirely. This is particularly frustrating when trying to set up some of the more dynamic poses that fans expect from their ninja characters. Had either the hands grip been a bit tighter or the sword hilts a bit larger, this wouldn’t be an issue. Oddly enough, Storm Shadow is one of the dreaded “double knee” figures who have issues sitting and yet this doesn’t seem to plague him as badly as it does other figures in the line. 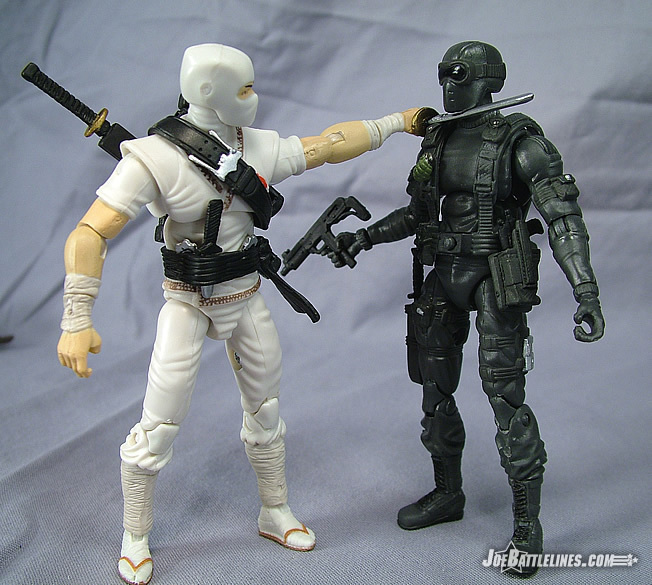 Storm Shadow is actually quite close to Snake Eyes in terms of range of movement and not nearly as stunted as figures like Duke and the Cobra Officer. So, while my issues with him do exist, they’re relatively minor when compared to his peers. 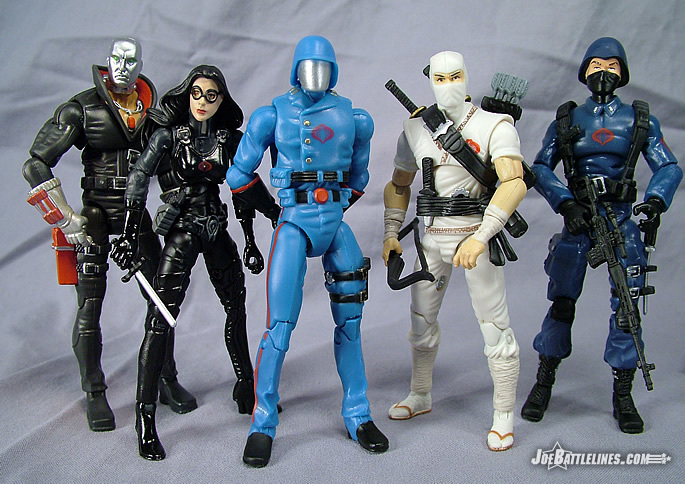 If all of the figures in this anniversary line were as well constructed as Storm Shadow, fans wouldn’t be nearly as disappointed with the debut of this line as I’m afraid they will be. Yes, he does suffer from some mobility issues but not nearly as badly as the majority of this line. True he does have extremely soft hands when it comes to holding his accessories but at least he can hold them. Perhaps my standards are wavering a bit but when compared to his peers this figure is practically made of gold and even his design issues just don’t seem “all that bad”. One of the best figures in the entire line, Storm Shadow actually gives me hope that Hasbro could salvage a line whose success rate has only been about 50/50 thus far. If we have more Storm Shadows than Dukes, this line just might endure and thrive. I can actually give this figure a recommend and will even go on the record as saying that I’m looking forward to his single-carded version.